You’re both right that mountains and glaciers can be dangerous places and definitely require some knowledge, skills, and gear in order to safely climb and travel across them. I’ll first explain what a glacier is, and then tell you about what makes them dangerous and how to work around these dangers. 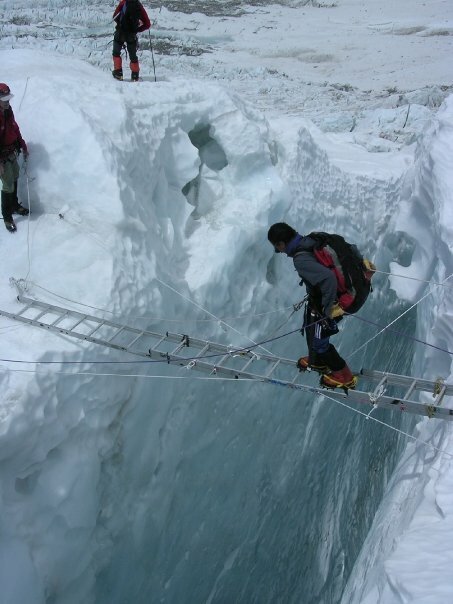 My teammate crossing a crevasse on Everest. A glacier is kind of like a big frozen river. Glaciers form in cold places—at the poles or in the mountains—where more snow falls than melts over the course of a year. This means that over many years the snow builds up and compacts itself into a big block of ice. Glaciers may seem frozen in place but they actually do move, just at a much slower pace than you or I do, so it would be hard for us to notice unless we sat and watched for months or years. When a glacier forms on a mountain it will flow downhill, like a river. Crevasses, which are gaps in the glacier where the ice has split, form because of disruptions to the glacier’s flow. Crevasses are the biggest danger to be aware of if you want to survive a glacier. Crevasses form when different parts of the glacier move at different speeds, causing it to break. Sometime the top and bottom move at different speeds because the bottom is slowed down from friction against the ground, whereas the top is not. The same idea behind why you would be able to quickly glide across a frozen lake, but not a rocky path. 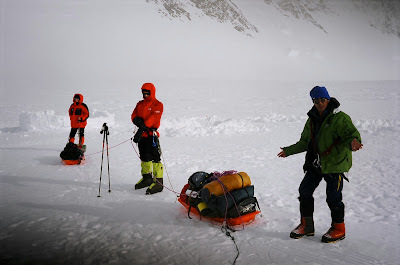 Roped up for glacial travel on Mt Vinson. Left to right: me, Doug, Victor. Most of the time we try to go around them, or over them on sturdy snow bridges, but crevasses are dangerous to mountaineers because it’s possible to fall in them—and it’s hard to get yourself or your teammate back out unless you’ve come prepared. Mountaineers typically travel across glaciers in a group all roped up together. That way if one person falls in, the rest of the team can anchor themselves into the ice to catch the fallen person on the rope. Once the team has built a solid anchor, the person in the crevasse can use what are called prusik knots to climb up the rope and out of the crevasse. I hope that helps, good luck with your speech!